To some, the idea of a Lamborghini SUV is tantamount to high treason. Over the past six decades the automaker has introduced the iconic Countach, Diablo and P400 Miura. Those cars inspired lust in our hearts and dug holes out of the bank accounts of the rich. How could the company chase a market with a vehicle you use to pick up your kids at school? First off, this isn’t the first Lamborghini SUV. The LM002 introduced way back in 1986 gets that honor. Second, the Urus is a result of all of your friends buying large vehicles to get around town. It would be dumb for the Italian automaker to ignore the potential to make lots of money. Lamborghini is betting big on the Urus (starting at $200,000 — no, really), and there’s a good chance that wager will pay off. 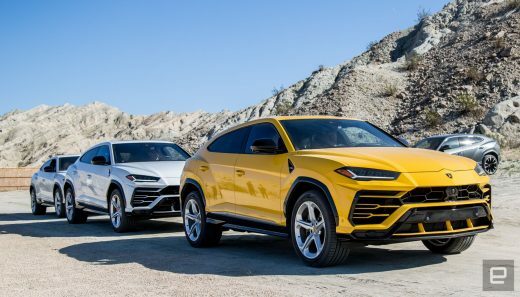 Yes, the Urus looks like your typical SUV with some sharper lines and the iconic Lamborghini bull slapped on the hood. And to be honest, it is. The design, while more aggressive than your typical SUV, is tame compared to everything else in the company’s stable. If it sped by you on the highway, you’d be forgiven for not noticing it shares lineage with the Aventador or Huracan. But it will speed by you on the highway. It’s powered by a twin-turbo 4.0-liter V8 that outputs an impressive 650 horsepower and 627 foot-pounds of torque. The all-wheel-drive vehicle will launch from zero to 60 in 3.6 seconds. It has an insane top speed of 189.5 miles per hour. Why does an SUV need to go that fast? It’s a Lamborghini, that’s why. On a track in Palm Springs, California, during the balmy month of December, I never got close to top speed, but at about 130 miles per hour, the Urus felt solidly planted to the asphalt. The cornering is also extraordinary for a vehicle of its size. Like every other Lamborghini out there, it’ll probably never be pushed to its limit, but the power is there when you need it. Lamborghini’s Tamburo drive mode select system helps the Urus behave itself on the track and on the street. Strada is for cruising around town and reduces the growl of the exhaust system. Sport opens up the power a bit more and tightens the suspension and steering while Corsa mode goes full Lambo. It snarls at traffic and obliterates every other SUV in the school drop-off zone. The automaker also added Terra (dirt), Sabba (sand) and Neve (snow) modes. The off-road trail where Lamborghini arranged for us to test Terra and Sabba didn’t feel adequate enough to fully evaluate the vehicle’s ability to tackle an off-asphalt drive. It can handle dirt and snow, but I’m not sure how much it can handle beyond a few encounters with sand and the equivalent of a fire road. Regardless of where you take the Urus, it’s the most civilized of the Lamborghini lineup. Inside, the dashboard layout still sort of looks like a supercar. But it’s filled with the niceties that anyone looking for a luxury SUV would expect. The front seats are heated, cooled and have a massage function. The infotainment system (based on Audi’s MMI) is leaps and bounds ahead of anything else the automaker is putting in its other vehicles. And it even has adaptive cruise control. It’s like when The Rock puts on a tuxedo. He’s still The Rock, just fancier. The Urus is a Lamborghini with all the insane speed and handling that come with that name. But it’s also something else. It’s the Italian automaker’s attempt to double its business. It will have its detractors, people who are outraged that it even exists. When the Porsche Cayenne was introduced 14 years ago, 911 fans lost their collective minds. Now Porsche’s SUVs outsell its sports cars. Porsche still sells the 911, and Lamborghini will continue to push the limits of what a supercar can do with crazy designs and giant engines. Those cars will just sit next to a vehicle that can actually be used to go shopping. Very fast shopping.